In a heatproof bowl, beat eggs and 1/3 C sugar on high, until thick and pale yellow. Put the bowl in a skillet of barely simmering water to make a bain-marie, and whisk until the mixture begins to thicken. Remove and let cool for 15 minutes, stirring occasionally. It’s important that the bain-marie not be too hot, because the eggs will curdle, much like Jason’s face when he reviewed ‘Lair of the White Worm’ – but luckily not today, today his face above the steam of the bain is shining and glossy just as the yolks. Amanda: I think this might be my first Magical Realism book, too. At least for modern times. I mean, there were a lot of elements I recognized from old-old literature: stories from the Arabian Nights, ancient Greek stories, even some of the older stories from the Bible (like Lot’s wife turning into a pillar of salt). I’m not sure I even knew what magical realism was until I read this book. It was really hard for me to classify it altogether. Historical fiction, cookbook, a bit of romance, a bit of the fantastical… thrown together, that made it all very unique. At least for my experience. Mexican vanilla is the best kind, with a lower alcohol content and a much purer taste. It also comes in a wine-sized bottle with a convenient long neck that Amanda grasps onto as she takes several quick, greedy sniffs after the bottle is opened. This leaves her brain-drunk and giddy for several hours, proving the good quality of the vanilla. Jason: I wasn’t sure how to think of the magic when you described it to me, before I read it. In the experience, though, it was part of the real power of the book, sort of this metaphor for the bubbling, powerful energy that lives in the woman, her family, in love, in the world, in food, etc. The entire conflict between the bubbling, earthy magic, that comes from the old ‘pagan world’ (the cook, the protagonist, the Navajo mother) and the cold necromantic magic of religion (her mother and her mother’s ghost, her older sister) felt like one of the real themes of the book. But then, I know you weren’t sure if you thought the book was supposed to be symbolic – what do you think, now, after a few days of reflecting? The cream and the vanilla – together, and alone, they are like a very thick glass of milk. It is the whisk that changes them; you whip and they thicken – but it’s not like a sauce. A sauce thickens when you make it heavier – flour or corn starch or roux. The cream is akin to the clouds, and when it is reintroduced to its old friend air, the two intertwine themselves into a powerful, pale nimbus. Amanda: It’s not that I didn’t think the book was symbolic so much as it had symbolism woven in, rather than being a single metaphor. It wasn’t like a fable, where everything stood for something else, but it definitely made careful use of symbolism. I can’t honestly say what the overall symbolism stood for, though. In some ways, the book’s message was really confusing to me because I’m so unused to the genre. In others, I think it’s fairly straightforward: love is the essence of life; a strong, powerful, burning force that can’t be controlled or put out. Not without a lot of work, at least. Any symbolism beyond that, someone would have to teach me and point it out. I’d love to learn some of the deeper layers of this. Right now I’m too ignorant to see them alone. The cream cheese must next be beaten until whipped and fluffy. Fold this and the yolk mix into the vanilla-perfumed whipped cream. This must be done as lightly as possible, to keep the custard airy, else the Tiramisu will be flat and heavy with disappointment. Jason: See, one thing that I thought was interesting, there was a sort of cosmic conflict going on it: good versus evil, chaotic energy versus ordered apathy, domesticity versus high-flown religion. In fact, it’s interesting to me, that there was a sort of Christ/Buddha/Orpheus symbolism surrounding the antagonist the whole time (think of, for instance, her being pierced by thorns, and then her sister eating the food that had her blood in it, and being redeemed by it, in a way…). But what was really GREAT about it was that it WAS a very normal story – girl wants boy, girl can’t have boy, girl fights for and pines for boy. If she was a real person, she would seem ordinary, even boring – she’s just a girl who lives with her mom and likes to cook, you know? But, the magic in the story reveals the real power of the everyday and the domestic, versus the phantasmic and eventually illusory power of the opposing force. There is more power in rolling out tortillas then in a mass, that was the message, I guess, that I got. How did the book make you feel? Lay the first layer of milanos, drizzle them with espresso, and spread half of the creamy filling across the top, tucking them in like a blanket. The milanos, before you spread them are like headstones or bassinets, and when filled with bubbling energy of the coffee bean, they leap and grasp towards the lips – the cream must lay down beside it and wrap it in its arms, to soothe it back to sleep, to lay it down again in its grave and rock it gently into the sleep. Now, do all that again, with the other milanos, the other water-of-life, the other blanketing custard. Amanda: Interesting ideas – I love the idea that the domestic woman taking care of her whole family is shown off as the one with real power – the real head of the household, despite being held down by the people around her. So often, the domestic person is the one that is ignored, even by the writer, unless they break out of their domestic role. In this book, however, Tita’s role in the kitchen is what influences everything. That isn’t an ordinary statement. Very refreshing. And very endearing. I loved Like Water for Chocolate. It was not at all what I expected going into it, and it’s going to stick with me for a long time. I really want to read more by Esquivel in the future. You? The last layer of custard lies across the top of the pan like an unsullied, creamy blanket. With a sifter, sprinkle a generous amount of unsweetened cocoa evenly across it, creating a unique Rorschach test that bleeds into the custard below. Jason: Oh yes! 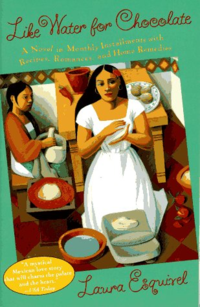 I’d love to read the new book about Malinche, particularly, and I’d really like to try some of the other giants of this genre: Isabel Allende, Gabriel Garcia Marquez, etc. That’s interesting about the power being in being the ‘housewife’ not in breaking out of that role. It was wonderful to read someone who loved taking care of people, rather than who was being slowly destroyed by it (you, know like The Awakening. Which I loved, don’t get me wrong). It was beautiful to read a book that glorified an ‘art form’ that we usually ignore, like cooking, it reminds me of the art displays they do now of old quilts, or incidental needlework. Overall, this was a very warm, comforting book, one that glorified in small things, and made you feel life has meaning for everyone, not just the famous and the obvious heroes. Any parting thoughts? The Milanos are wed to the custard, and laid down in their beds. Their marriage is blessed by the pixie dust of cocoa across the top. And now, cover it loosely with saran wrap, like a sly rose laid across the nuptial pillow; set it away in the fridge; and leave it be. An hour is fine, but a day is better – food, like love, takes time to be at its best, and with time, the cream is filled with the invigorating seed of the cookies, the cookies filled with the subtle transcendent intoxication of the cream. Amanda: Nothing much, just that I’m so glad to have read this book. Plus, I didn’t realize Marquez did magic realism and I’m now looking forward to his books even more! Amanda: The first time we made Tiramisu was back when we were a young couple in college. We didn’t know where to find ladyfingers (plus, our rundown grocery store in 3rd ward Houston probably wouldn’t have had them anyway), so we substituted Milano cookies, which worked infinitely better in our opinion. We’ve used them ever since. We also didn’t drink coffee, nor did we know how to make espresso, so our “espresso” involved hot water and some spoonfuls of instant coffee granules. We also kept out the normal alcohol content for simplicity’s sake. Our version is not at all like the Italian recipe it comes from, but it actually tastes far better and is always a hit when we serve it. Jason: We’ve made this recipe a number of times over the years, though, in classic Jason style, the recipe is a little fuzzy (nothing I cook is ever the same twice, unfortunately). But, we hope you enjoy eating it, as much as we enjoyed reading this book. It’s at least a LITTLE easier than some of the recipes in this book – holy cow, Laura Esquivel! This entry was posted in 2009, Adult, Prose and tagged atmospheric, favorite, food, historical, joint review, Latin America, memorable, POC, speculative, translation. Bookmark the permalink.